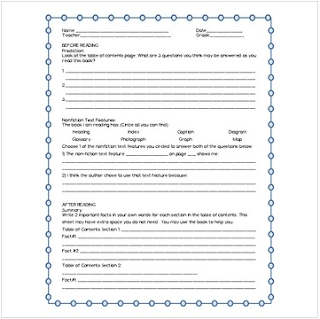 This is a form you can use to have your students practice completing the written retell for the DRA 28. I find sometimes it's not that my students don't know the answers to the questions on the written retell portion of the assessment, but that the form is unfamiliar and that causes them some trouble with passing the written portion of the test. This is a generic for for practicing the DRA questions using any nonfiction text you may be working on during guided reading. I generally preprogram the summary headers for my students, and make a text specific Literal Comprehension Question, and Interpretation question for students to answer along with this worksheet. Good luck!